The Iowa Credit Union Foundation is now accepting applications through Friday, Nov. 16 for the Small Credit Union Grant made possible by Veridian Credit Union. Apply now by downloading the application. Contact Jaimie Miller at 515.221.3001 with questions. Thank You for Supporting Benefit Night! Thank you for supporting the 2018 Iowa Credit Union Foundation (ICUF) Benefit Night Fundraiser during the annual Iowa Credit Union Convention. Every dollar raised from ticket purchases, silent auction bids and Friend of the Foundation donations enables ICUF to impact more lives throughout the state of Iowa. Thanks to your generosity, Benefit Night raised $71,000! The night truly showcased the "people helping people" philosophy of the credit union movement. 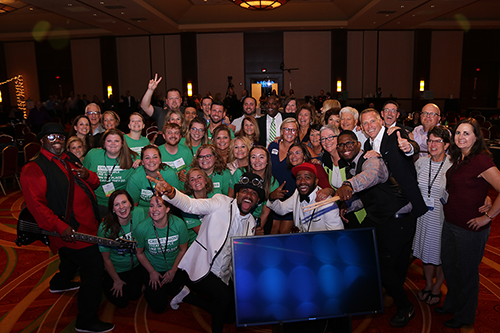 Nearly 300 individuals gathered to celebrate and honor the philanthropic impact of Iowa credit union leaders and raise funds for the needed programs, grants and services provided by ICUF. Click here to view photos from Benefit Night! 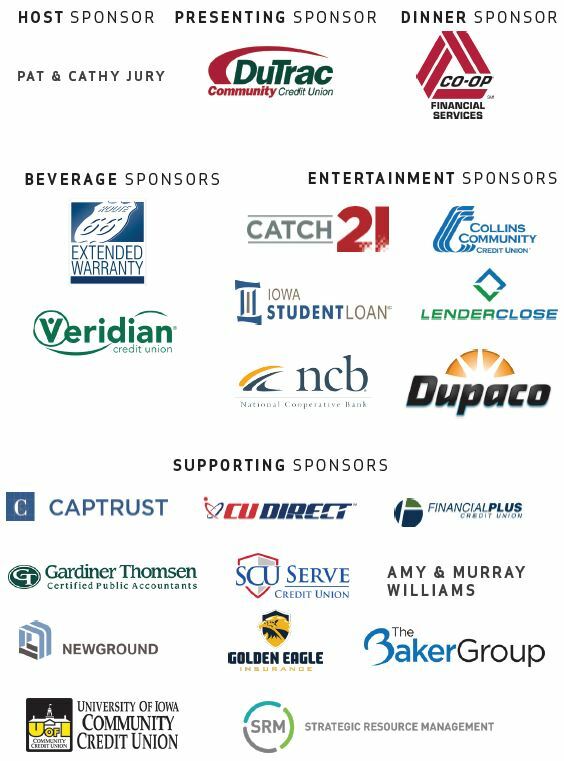 Thank you to our Benefit Night Sponsors! 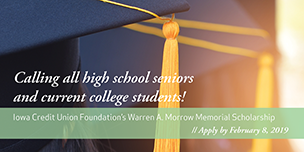 The Iowa Credit Union Foundation (ICUF) will open the Warren A. Morrow Memorial Scholarship for applications beginning on Friday, Oct. 26. $11,500 in scholarships will be awarded to high school seniors and graduates. The annual scholarship program honors the late Warren Morrow, the founder of Coopera and a visionary in the credit union industry who dedicated his life and career to helping the underserved. High School Scholarship - Designated for high school seniors planning to enter college in 2019. Post-High School Scholarship - This scholarship is designated for individuals entering or attending an accredited undergraduate, graduate or vocational program in 2019. Two $2,000 scholarships will be awarded. Applications will be available on Friday, Oct. 26. Marketing and promotional templates will be shared once the scholarship application is open. 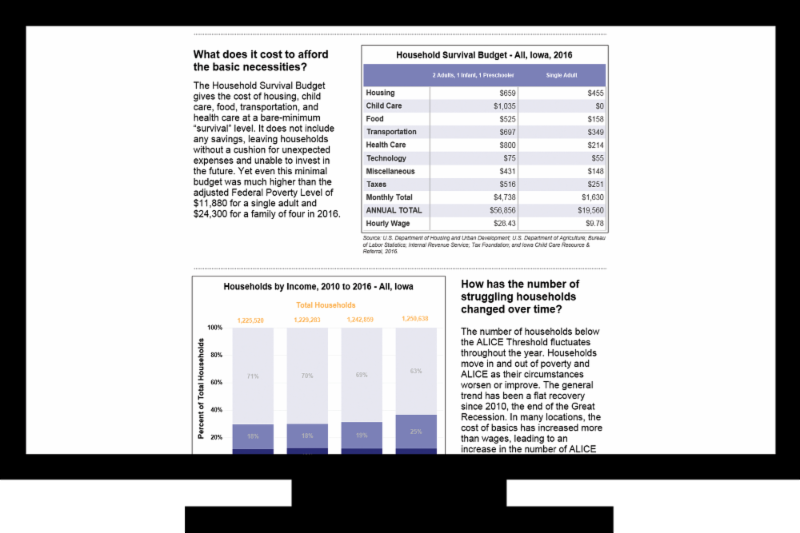 The Iowa Credit Union Foundation has teamed up with the United Ways of Iowa and Alliant Energy to fund the 2018 ALICE Report. This report is a valuable tool gaining perspective on the growing financial struggles of Iowa's families. ALICE is an acronym that stands for Asset Limited, Income Constrained, Employed. These are working families that have income above the Federal Poverty Level (FPL), but cannot make ends meet each month. We invite you to visit our webpage to learn more about this special report and download it for review. If you find the report of interest, you may request an in-person presentation of the data from ICUF as well. ICUF was established in 1995. Our mission is to empower people and communities to achieve financial well-being by championing the credit union philosophy of "people helping people."